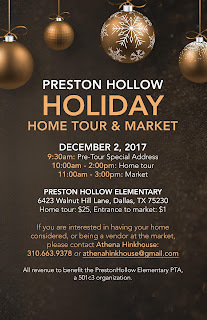 "We are hosting a Holiday Market as fundraiser to raise money for Preston Hollow Elementary. Our gym needs a face-lift and our classrooms need some updated technology. 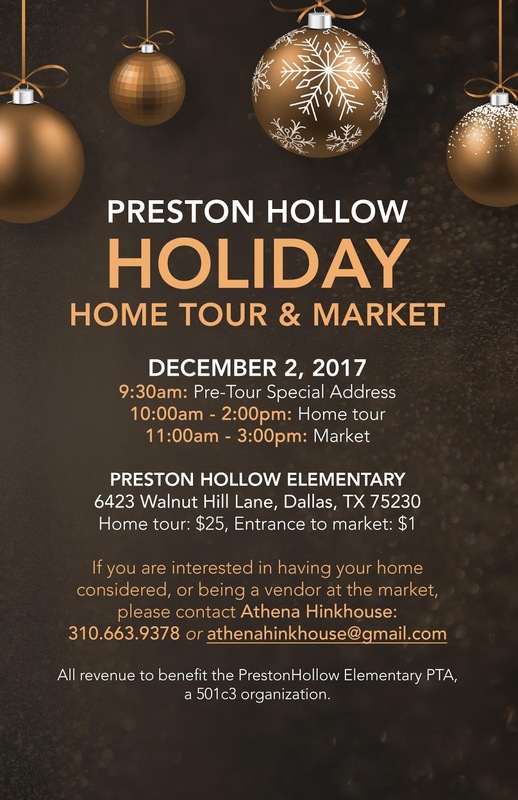 We are an International Baccalaureate school and are looking for local vendors who have worldly goods that people will be interested in purchasing as gifts or for themselves. We appreciate the different, hand made, and creative items. " Booths are 10 X 10 and cost $100 or 10% of sales over $100. This fee includes electricity, the warm and fuzzy feeling of helping a school in need. 90% of the children who attend live outside of the neighborhood, and considered low income. Applications are available here (along with rules) and are due by November 15, 2017. For more information, contact their event coordinator at athenahinkhouse@gmail.com / Athena at 310 663-9378.